It was a strange sight outside today — accumulating snow on the ground and clinging to leaves on the trees. Who could have imagined such a sight on Oct. 12? I’m sure there are lots of depressed folks groaning at the early arrival of the white stuff. But, I wasn’t too bummed out. It’s not going to last. In fact, I saw an extended weather forecast that predicted a high of 60 on Sunday. Actually, I took the opportunity to pull out my camera and take a few shots of the white landscape. 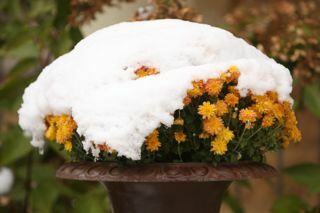 The most unusual sight was a layer of snow on top of flowers still in bloom. The petals will win the battle for now, but their days surely are numbered. I figured the hard frost we got over the weekend would mean farewell to the flowers, but these persistent blooms are hanging on. Flowers and snow are a rare combination. About the only time it seems possible is mid May and again in October. But, I don’t recall ever seeing it before. So, naturally, I felt compelled to record it with my digital camera. Later in the week, the snow will be gone, I’m sure. In fact, early this afternoon when I was taking pictures, the snow was already melting and falling in large clumps off the tree branches. So, even though there are mild days ahead — even, Indian summer? — I can’t help but wonder if this event is a sign of things to come. Weather experts likely will tell us there’s no need to panic just yet about a possible harsh winter ahead. But, I’m not so sure. It has been a while since we’ve had a winter that’s high on the severity index. We’re probably overdue. Well, we’ll just have to take what comes. I’m just hoping things will warm up for my fall turkey hunt later this week. I like seeing fall colors when I’m walking the woods in search of a fall turkey, not snow.